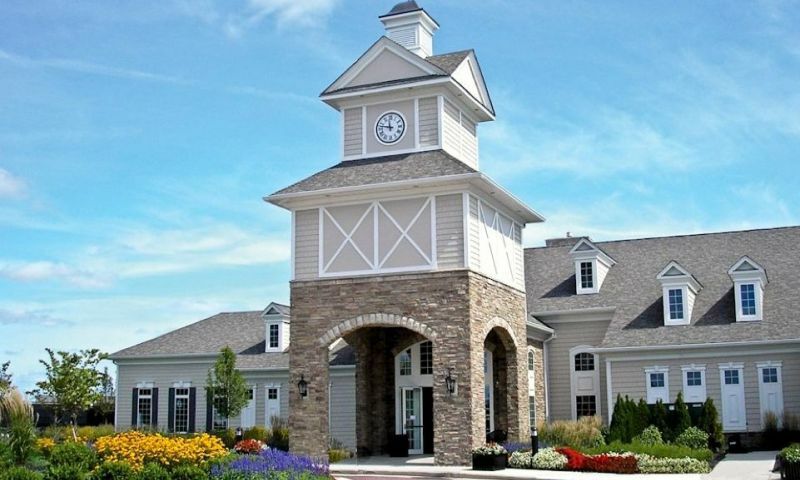 Pioneer Ridge by Del Webb in North Ridgeville, Ohio is an active adult community for residents aged 55 or better. Pioneer Ridge offers homebuyers the luxury lifestyle with low-maintenance homes, a gated resort-style community, a clubhouse full of amenities, and plenty of social activities. Homeowners seeking an active lifestyle can enjoy their best years worry-free while having fun at this vibrant 55+ community. Pioneer Ridge's amenities are sprawled across eight acres of beautifully landscaped grounds. The 14,500 square-foot Prairie Lodge is the social hub of this active adult community. It provides everything a resident would want and need to have an active social life and healthy lifestyle on a daily basis. Prairie Lodge features a state-of-the-art fitness center with cardiovascular machines and weight-training equipment so active adults can stay fit. There is also an indoor pool where residents can go for a swim or relax in the adjacent spa after a long day of fun. The multi-purpose room, lounge, and sunroom can all be used for a variety of indoor activities, such as card games, dances, seminars, lectures, or meetings. Residents have plenty of fun activities to do outside as well. They can play a friendly game of bocce ball or get competitive with a basketball, pickleball or tennis match at one of the on-site courts. Homeowners can also swim a few laps in the outdoor pool or lounge around on the patio. A playground is also available so grandchildren can come and play when they visit. With plenty of walking and biking trails, residents can take pleasure in the outdoors surrounded by nature and scenic views of the neighborhood. There are a variety of flexible floor plans available within the Pioneer Ridge active adult community. Homeowners can choose a number of floorplans that range from 1,197 square feet to 2,536 square feet of living space. Single-family ranch homes feature one to three bedrooms, one-and-a-half to three-and-a-half bathrooms, and two to three-car garages. Some models feature a den or library. The attached homes feature two bedrooms, two bathrooms, and a two-car garage. Most of the floor plans feature spacious master suites, useful indoor and outdoor living space for entertaining, and plenty of storage space. Homeowners can also customize their home by adding optional basements or second-story floor plans that include loft space and extra bedrooms and bathrooms. Residents at Pioneer Ridge have the benefit of leaving the hassle of home maintenance to the homeowners association. The fee includes landscape care, snow removal, common areas maintenance, and the assistance of an on-site full-time lifestyle director. Active adults won't have a dull moment living at Pioneer Ridge because of all the diverse clubs, groups, and activities available at this 55+ community. Residents can choose to join a wine club, book club, or knitting circle. They can take classes and learn how to line dance, buy apps for their smart phones, or analyze handwriting. Homeowners can play a fun game of bridge or poker, attend a holiday picnic party, or have drinks with a neighbor during happy hour. With so many activities to choose from, the only thing Pioneer Ridge residents need to worry about is deciding which group or club to join. Pioneer Ridge residents also have access to a lifestyle director that helps organizes trips, seminars, clubs and social activities every day. Pioneer Ridge by Del Webb is located west of Cleveland and is only a short 25-minute drive from the city. Residents seeking farther travel can hop on a plane at the Cleveland Hopkins International Airport that is only 15 miles away. The Rock and Roll Hall of Fame and Avon Commons Shopping Center are also a short drive from this active adult community. With so many shopping, dining, and entertainment options nearby, 55+ homeowners at Pioneer Ridge can enjoy the hometown feel of North Ridgeville while having easy access to the city life of Cleveland. Prairie Lodge - 14,500 Sq. Ft. There are plenty of activities available in Pioneer Ridge. Here is a sample of some of the clubs, activities and classes offered here. Homestead Villas are attached homes. All units include two bedrooms, two baths and two-car garages that range from 1,299 square feet to 1,550 square feet. These homes are available on a resale-only basis. These homes offer two bedrooms, two or two-and-a-half bathrooms, and two or three-car garages. Some models feature a den. These single-family homes range from 1,197 to 2,274 square feet. These homes are available on a resale-only basis. The Frontier Series offers three floor plans with great space for entertaining and relaxing indoors and outdoors. Homes range from 1,222 square feet to 1,498 square feet. Frontier models have one to three bedrooms and one-and-a-half to three bathrooms. These single-family homes also come with two or two-and-a-half car garages. These homes are available on a resale-only basis. Expedition models are available in four floor plans and offer spacious storage and plenty of open living space. Homes range in size from 1,683 square feet to 1,953 square feet. These detached homes feature two or three bedrooms, two or three bathrooms, and two or two-and-a-half-car garages. These homes are available as new construction or resale. Legacy ranch-style models are offered in four different floor plans. Homes range in size from 2,163 square feet to 2,536 square feet of living space. Legacy models have two or three bedrooms and two to three-and-a-half bathrooms and a two or two-and-a-half-car garage. These homes are available as new construction or resale. We moved to Pioneer Ridge to be close to our kids and 3 grandkids. We lived in Florida for 7 years prior to moving here, and I was nervous about dealing with the winter again. I can honestly say that we absolutely love living here! The residents are some of the nicest people we have ever met and they are now our closest friends. The amenities are out of the world and the snow isn't that bad when you never have to shovel! This is a phenomenal place to live. We have lived in the area for years and were very excited when Pioneer Ridge opened. We were not quite 55 at the time but knew it looked like a great community when the time was right, plus we were already familiar with other Del Webb developments from our trips to Arizona. We finally bought our home here in 2010 and have been loving it ever since. We spend a lot of time using the clubhouse and are both very active. We enjoy the book club, wine club, garden club, poker, photography ... we love it all! 55places.com is not affiliated with the developer(s) or homeowners association of Pioneer Ridge. The information you submit is distributed to a 55places.com Partner Agent, who is a licensed real estate agent. The information regarding Pioneer Ridge has not been verified or approved by the developer or homeowners association. Please verify all information prior to purchasing. 55places.com is not responsible for any errors regarding the information displayed on this website.